well I love your rocks!!! More hearts. I love them. Congrats on getting on blogs of note! hi there - this is a great blog - i keep wishing i knew how to cook, had the time to learn to cook, lived somewhere rural etc etc etc. i am reading the 'Toasted Almond Chocolate Chip Biscotti' post and by crikey i want some. Nossa, pedras e alho. Deve ser legal. Ou não. I am so jealous. You are living the life that I only dream about. Blessings. tabitha collects heart rocks too. you have some admirable ones there. i just tried to braid our recent harvest of garlic with limited success. Hey there! I'm new to this whole blogging thing. Your blog is great! I moved from the country into the city. I really miss it! Your pictures are like a breath of fresh air to my soul. Thank you! It is nice to see so many spade-shaped objects. Really makes you think. I want to thank you for introducing me to green garlic. I had never heard of it before and now love it! I have eaten most of my meager planting. I can't believe how many heart rocks you have found. I will have to pay more attention to the shapes around here. 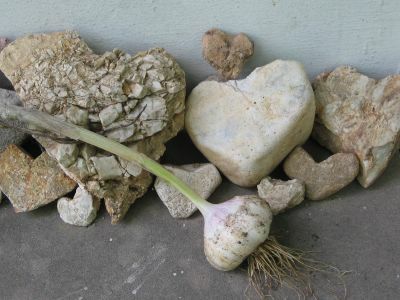 Garlic, like so many things, is indeed best when homegrown. Sticky, sticky, and slightly sweet--that's how I like mine. We're pulling it up by the basketful here in Carolina. Vampires beware!